Seam Binding Same ribbon, two styles - Modern or Vintage. Want the crisp, clean Modern look, then leave the ribbon as it is. For the crinkly, aged Vintage look, spray with a little water until it is moist, scrunch up into a ball and leave overnight to dry - simple! 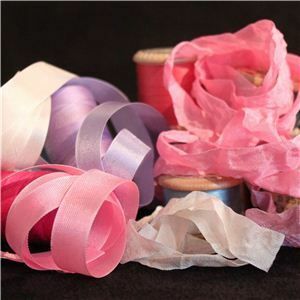 124 awesome colours to choose from, 14mm 100% Rayon American Seam Binding Ribbon. Seam Binding Ribbon - Ivory(undyed).